Most of the world’s utilized freshwater goes to agriculture. In fact, agriculture accounts for 70 percent of all withdrawals, a figure that increases to 95 percent in developing countries. China is no exception, with 62 percent of its water used for agricultural purposes. Assuming current trends, according to the FAO an additional 14 percent will be needed for agriculture if the world is to achieve the necessary 55 percent increase in food production by 2030. Over the next 50 years, water shortages in agriculture are predicted to be the single biggest constraint facing food production. Yet does a rise in food production necessarily mean a rise in water use? Calculating and assessing the water use for food production is difficult, as it depends on the source or origin of water, and the local water availability. Technology in agriculture can help save water – either directly through better irrigation systems or by planting crops that require less water, or indirectly via yield-increasing products and methods. As the world’s leading chemical company, BASF is in contact with growers from every part of the globe, and we have collected six ideas from around the world that could help China use water more efficiently. Making changes in cropping choices to focus on crops and foods that use less water can have a significant impact on water reduction. With its large and diverse land area, China has strong potential to redistribute its cropping distribution to ensure that water intensive crops are planted only in areas that can support them in a sustainably way, while less water-intensive crops are focused in drier areas. Dietary changes are hard to implement but can make a difference. While the daily drinking water requirement per person is only two to four liters, the production of 1,000 kilojoules of food requires an average of 83 liters of water and depends heavily on the type of food. For example, one apple takes 70 liters of water to be produced. We helped our supermarket partner, REWE, the second-largest supermarket chain in Germany, to source fruit and vegetables more sustainably. Looking at the entire end-to-end process from tree to shelf, we analyzed the eco-efficiency of Braeburn apples – including the water needed to produce them – grown during both November and April from regions in Germany, Italy, New Zealand, Chile and Argentina. Many companies, farmers and farmers’ associations, governments, authorities and agricultural advisors initiate and support training programs, such as The Voluntary Initiative in the UK, in which BASF plays a part. This organization develops practical risk assessment and training concepts to achieve a reduction of water pollution in agriculture. As a company, BASF continues to inform and train farmers on general best management practices by providing information and training material to advisors and farmers. In addition to general water protection measures, BASF defines and promotes specific use requirements for relevant products, such as reduced maximum application rates or use restrictions in vulnerable areas. In India, BASF conducts the Samruddhi program to help farmers increase yield while reducing pollution and runoff. BASF agronomists work with the farmers throughout the whole season. They provide town-hall education for participating farmers, conduct on-field trials, visit the individual farmers on their fields and accompany farmers to harvest and market days advising them about price making and negotiation practices. Each farmer is also provided with individual grower’s worksheet to help them control costs and earnings and to calculate the profit per acre. Using the ratoon cultivation method, in which sugarcane ratoons are left in the ground after harvesting for new plants to emerge, decreases the number of times fields are tilled, and the area of cultivated land. This helps to prevent surface runoff and soil erosion during rain, and also preserves coral reefs. One of the most important sources of sugar in Japan is the sugarcane grown in the southwest islands of Okinawa and Kagoshima prefectures. Cultivating sugarcane requires controlling wireworm, an insect pest in the soil. Wireworms eat the shoots of sugarcane plants. However, in ratoon cultivation there is a threat that wireworms will damage the new shoots. Previous pesticides did not take into consideration this method of leaving the ratoon in the ground. BASF’s Prince Bait solves this problem. Used during summer and spring planting, Prince Bait controls wireworm and makes ratoon cultivation possible. Prior to the launch of this product, the only option was to till the field and plant new crops. The expenses for tilling the field, purchasing new seedlings, and eliminating pests in new agricultural land involved considerable cost. Prince Bait allows for low-cost sugarcane cultivation, and has led to an expansion in the growing area for ratoon cultivation. For BASF, product stewardship begins at the research and development stage. One example is our so-called “stick & stay” formulation technology that enables a crop protection product to stick to the leaf instead of being washed off into the soil and potentially further on into groundwater by the next rain. Likewise, innovations like BASF’s EcoMatic®, a unique packaging and closed-transfer delivery system that operates during filling and mixing, protects operators and water resources by reducing the risk for spilling incidents. Our commitment continues through to the disposal of empty containers. BASF supports container collection and disposal programs like inpEV in Brazil, which reduce the risk of crop protection products entering water from dumping sites of discarded containers. More food production doesn’t have to mean more water use. Efficient and sustainable agriculture plays a critical role in meeting the challenge of global water supply. By using innovative agricultural solutions and participating in stewardship programs, farmers can improve plant health, yields, and food quality while also becoming more successful in sustainable water management and protection. 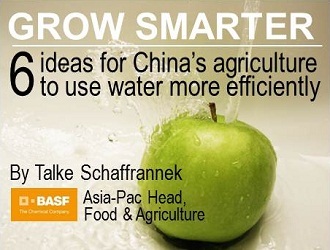 Mrs. Talke Schaffrannek has been the Regional Head of Industry Target Groups, Food & Agriculture of BASF Asia Pacific. She has been based in Shanghai since 2010. Previously, she gained experiences in various companies in South Africa, France and Germany. She joined BASF in Ludwigshafen in 2004 as product manager for an operative business unit, worked in strategic marketing and later was responsible for the business case and change management for the global Diversity and Inclusion project. In her free time, Talke supports a microcredit project for women in Northern Nigeria.